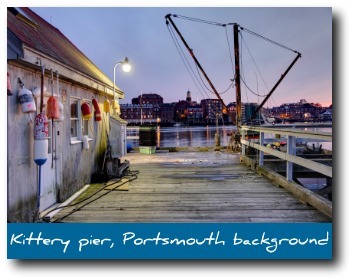 Find A Great Kittery Maine Vacation Rental Here! Kittery Maine hotels and lodging can land you smack in the middle of all the outlet shopping you could ever want, or cater to your desire for quiet luxury by the sea. The town of Kittery is known for its' outlet malls and terrific shopping, of course, and there are certainly a lot of day trippers enjoying themselves in Maine's southernmost town. But some of you either want to shop for days on end, or live too far away to make it a day trip. If you need to spend a night or two in Maine, read on for a guide to Kittery Maine hotels and other types of Kittery Maine lodging. Kittery hotels include well-known national chains that we all know, like Days Inn and Ramada Inn, but there are a few very lovely bed and breakfasts and locally owned and operated hotels in Kittery Maine as well. And if your week-long shopping excursion and exploration of Kittery requires renting a waterfront "castle" that has 4 1/2 bathrooms and sleeps 10? Well, we've got that, too (see vacation rental link at top of page). Below is a list of Kittery Maine accommodations -- use these helpful links to make the most of your stay in this wonderful coastal Maine town. Days Inn: 85 U.S. Route 1 Bypass, Kittery, Maine 03904. 1-207-439-2000. Coachman Inn: 380 U.S. Route 1, Kittery, Maine 03904. 1-207-439-4434. Ramada Inn: 2 Gorges Road, Route 1 Bypass, Kittery, ME 03904. 1-207-439-5555. Northeaster Motel: 79 Old Post Road, Kittery, ME 03904. 1-207-439-0116. Enchanted Nights Bed & Breakfast: 29 Wentworth Street, Kittery, ME 03904. 1-207-439-1489. Portsmouth Harbor Inn and Spa: 6 Water Street, Kittery, ME 03904. 1-207-439-4040. Like Inside York Maine Vacations on Facebook -- News, Tips & More!